Corsica is a rough mountain rising from an enchanting sea. As simple as that. The island was called Kallistè (the most beautiful) from Greeks, and really it’s an ultimate paradise for active tourism. 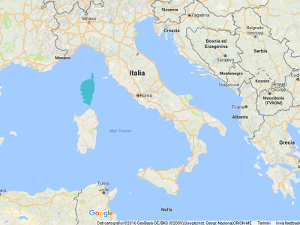 Closer to Italy than to France, but politically part of France. About 115 days of sunshine. From maritime to alpine landscape. 4 international airports (Ajaccio, Bastia, Calvi, Bonifacio). We’ll start designing your tour. If you are looking for nature at its best this is a place to visit, from rugged west coast to the majestic mountains of the interior, to the peaceful vineyards on the east coast to the scenery of the northern cape, you’ll experience some of the best sceneries of your life. If you are on a cycling trip you must ride the finger of Corsica, best way is starting from Bastia and riding counter clock wise until Saint Florent, this way you’ll have the sea on your right along all the ride. Of course have an hike inland, Valle della Restonica is easy to reach and there some great trails. Corsica cuisine it’s a mix of Italian and French, just to pick some tasty dishes, we love the cannelloni au brocciu, a kind of local ricotta cheese, the hearty Chevre Chaud salad, with warm goat cheese spread out on sweet bread, The Aubergines Bonifacienne, a great interpretation of stuffed eggplants. But Corsica is definitely home for some of the best cured meats of the world. Why? Because Corsican pigs live an happy and healthy life, and because Corsican weather is perfect to dry out meats. Well, do not expect the big reds you can find in France or Italy, but thanks a weather allowing to grow very diverse grapes, Corsica is an interesting wine destination. Yet we have to say that Corsican AOC wines resemble each other, in fact the AOC “controlled designation of origin” rule holds to a rigorous set of standards, including the use of very few grapes, the most used are Niellucciu and Sciaccarello on red and Vermentino on white. In any case you’ll be very glad to discover some fantastic Rosés and of course many fair reds and classy whites. Corsican are a fierce and proud people. Most of population feels Corsican rather than French, they speaks the corsican language (very similar to old tuscan/genoan ) on everyday basis, at the moment the region is governed by the corsican party. This proudness shows also on the affection that locals have for their environment, and you can notice it by the very few chain resorts or chain food on the island. Probably the most known of Corsican tradition is the Polyphonic singing, you’ll easily find an exhibition during your stay. If you have the chance to participate to the holy week during Easter, you’ll be fascinated by the procession of local brotherhoods, where men totally hide under the hood. Corsica has a strong Italian heritage, the island become french in the 1768, when Genoan gave the island to French under the treaty of Versailles, and that’s quite clear in the language, but also in the architecture of many of its town and villages. Ajaccio is the birthplace of Napoleon, but Corsican do not seem very proud of it, considering the emperor a betrayer of Corsican nation. The father of the country is Pascal Paoli, follower of the Enlightenment and in command from 1755 to 1769, that created the first Corsican Constitution. Have a dinner overlooking the cliffs in Bonifacio, for an ultimate romantic dining experience. If you are brave enough jump on the clear and super fresh water of a river…better in late summer! Taste the Pietra, great local beer that gets flavored with chestnut. Discover some secret beaches, like the Acciaro plage just before the crowded Palombaggia, or the ones along the stunning yet bumpy road D81b from the cool Calvi with its pink granite, to the secluded Galeria, that offers some wild black sand beaches. These samples are just ideas to inspire you. Tell us your desires, we’ll get back to you with a custom proposal. The whole natural beauty of Corsica during a glorious cycling week. Starting from Bastia we’ll cruise to the extreme North, then we’ll pedal counter clock wise, staying by the ocean all way down, capturing the best ever views you could imagine.